Provides longer protection and maintenance of the hair color. 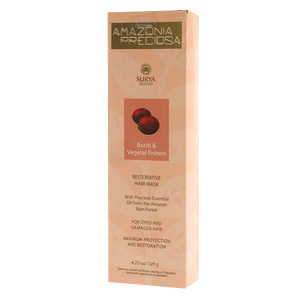 A complex of vegetal proteins restores the hair fiber, preventing split ends,while the Buriti oil naturally absorbs the ultra-violet rays.Rich in Vitamin A, protectst the hair against drying and gives extra shininess. CAUTION: Keep out of the reach of children. Do not swallow. In case of eye contact, flush with plenty of water. For external use only. For deep conditioning, use twice a week. After washing the hair, apply the hair mask and massage softly.Cover with a thermal cap or a hot towel leaving on for 10 to 15 minutes.Rinse thoroughly. Buriti Hair Mask Dyed Hair - is shipped in a discrete, unmarked package. Orders are processed immediately and usually take about 3 to 5 working days to be received. We do ask that you try it for 2 to 3 weeks to feel the full effects. Any information received is used only for order processing and shipping purposes. Your information, such as e-mail address, will never be disclosed to a third party.